McGill-Queens University Press, 134 pages. 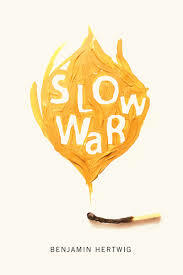 Hailed as being in the tradition of Wilfred Owen’s “Dulce et Decorum Est,” I imagined that Benjamin Hertwig’s debut, Slow War, published as part of the Hugh MacLennan Poetry Series, would place readers in the midst of America’s longest war for the duration of the collection. But Hertwig, a former member of the Canadian Armed Forces, does something more powerful. The speaker’s tour in Afghanistan spans only twenty or so vivid, quietly terrifying pages. “Iconoclast,” which opens and closes with the same lines: “the war is over / and we are still // here,” signals a shift. With characteristic sparse and rending simplicity, the double meaning is poignant—the speaker has both survived the war physically unscathed yet continues to inhabit a psychological space in which warfare is still very much alive. In a sense, all war is slow when you consider, as these poems do, its lasting bruise to the human spirit. Slow War begins with a brief dwelling in childhood; brief, because the speaker is just barely past the green of adolescence when he heads off to war. In the biblical intonations of the opening poem, “Genesis,” the speaker witnesses a brutal scene on his elementary school playground: “I watch you kick / the dark-haired boy / in the stomach. / you kick him more than once. / you are familiar with violence. / he started it, you say.” The othering of the “dark-haired boy” and the childish justification of repeated cruelty is both chilling and familiar: how is such a sinister parallel between war and play hardwired into children from such an impossibly early age? “First Kill” details the early inheritance of a masculinity that’s often tied to the experience and perceived inevitability of violence. When the twelve-year-old speaker’s grandfather runs over a small animal, he proceeds to cut its throat while insisting the boy watch: “I want you to see,” he says. After the act is done, the grandfather “wipes the blade on felt pants” and claims, “it had to be this way.” In a later poem, the adolescent speaker sits on his bed reading Harry Potter and the Prisoner of Azkaban and wondering if “the girls at school / will like [him]more / for having gone to war.” This is a young person who has by no means reached emotional maturity, who does not yet “understand / metaphors for breaking, being broken.” The reader understands, though, and suddenly heartbreak seems not so cliché. Hertwig’s hope, “not a byproduct or waste,” is hard-earned. In a later section of “A Compendium of Hands,” the speaker encounters “Omar Khadr / at a camping store / while trying to find / a tent” and recalls having heard someone say, “Omar Khadr should rot in jail / for the rest of his days.” In awe, the speaker “[reaches]out and [shakes]/ Omar’s hand.” “A Poem Is Not Guantánamo Bay,” dedicated to Khadr, acknowledges poetry’s shortcomings, its inability to stand in for the suffering of lived experiences. Meeting with Khadr to share a meal, the speaker asserts: “a poem isn’t even a decade later when you are not a soldier / and he is not in jail … a poem is not a way out of a poem, but the bowl before you is / a bowl.” The power here lies beyond the poem, in the one-on-one human connection it might initiate. sealed shut. Sing for me, alright? Wolsak and Wynn, 96 pages. 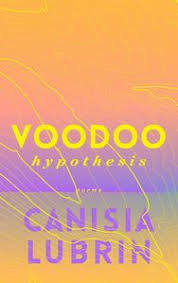 Voodoo Hypothesis does not feel like a first book. Lubrin merges the music of a strange, ornate syntax with Caribbean Creole, patois, and formal fragments. Each stanza—true to the Italian meaning of the term—makes us feel like we’re moving from room to room under the roof of something expansive, all encompassing. The result is a style that is as distinct as it is fully formed. Though dense, lush, and at times hard to parse, the work exudes a roving curiosity paralleled in the title poem’s chronicle of the Curiosity Mars Rover’s expedition to that planet. The poems are so rich and pleasurable that they earn a slow and considered attention. Readers readily sign on to “the erratic contract / of this anti-story finding language” as Lubrin re-narrativizes a complex and contemporary black selfhood with power, tenderness, and grace.